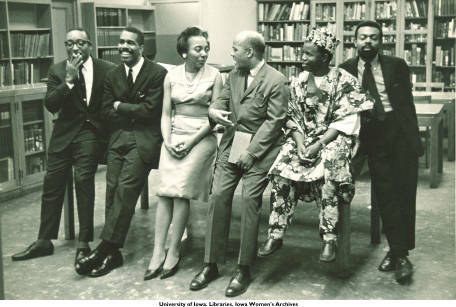 Chinua Achebe (1930–2013) never came to Iowa City, so our connection with him in our collection is slight. However, since he recently died and given the importance of his work, I wanted to highlight a few items in our digital collections. 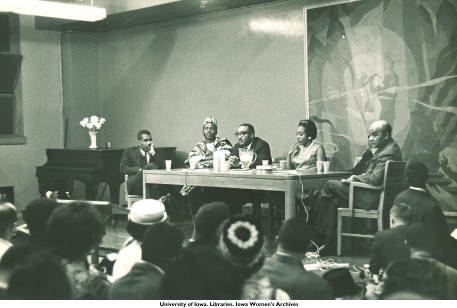 The Esther Walls papers include 3 pictures of him at the Countee Cullen Branch of the New York Public Library in May, 1963. He was part of a black writers panel, moderated by Esther Walls. Other panelists were Louis Lomax, Bill Kelley, John Killens and Leroi Jones. We of course also have many books written by him; reading his works is the best way to remember his legacy.